We’d love your help. Let us know what’s wrong with this preview of The Secret Chord by Kathryn Guare. Readers who love romantic suspense and "thrillers with heart" have found their new literary crush. Conor McBride has lost everything, and if he can't find a way to disappear in a hurry, the next thing he loses could be his life. Running from enemies he's never met and haunted by Readers who love romantic suspense and "thrillers with heart" have found their new literary crush. 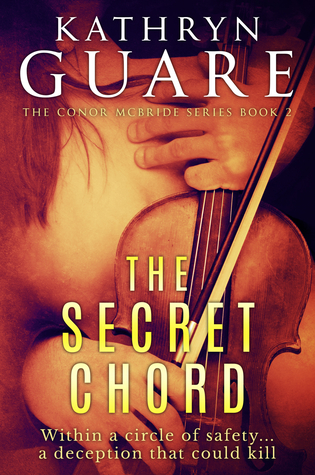 To ask other readers questions about The Secret Chord, please sign up. Though I don't usually read international thrillers or romances, Kathryn Guare has completely won me over. Deceptive Cadence, the first book in her Virtuosic Spy series was impossible to put down, with a complex plot that kept me on my toes. I was swept away once again by the second volume, Secret Chord. What hooked me? Guare does an amazing job giving her reader both an exciting plot and intriguing locales. I especially love her descriptions of India.. However, for me, her characters make the b Though I don't usually read international thrillers or romances, Kathryn Guare has completely won me over. Deceptive Cadence, the first book in her Virtuosic Spy series was impossible to put down, with a complex plot that kept me on my toes. I was swept away once again by the second volume, Secret Chord. What hooked me? Guare does an amazing job giving her reader both an exciting plot and intriguing locales. I especially love her descriptions of India.. However, for me, her characters make the books. The Deceptive Cadence characters—tough but vulnerable Conor, mysterious Frank, and complex Sedgewick—are back in full force. Add to them a great new group of women, especially Kate, Connor's love interest, a widowed Vermont innkeeper and frustrated artist, and her pals, sassy Abigail and straight shooter Yvonne. Each major character has a rich, fully developed inner life. That's what hooked me. Bravo to this new author. i can't wait for the next book. Hurry up, Kathryn Guare! This fan is hungry for more. I was really excited to dig into this book because Book 1 was so good. This story had it’s charms as well but I did enjoy the first book more. Our hero, Conor McBride, is in dire need of some serious rest and relaxation. He goes to great pains to walk away from the espionage business that entangled him and his brother in Book 1. A fancy but quiet Vermont Bed & Breakfast needs an experienced dairy farmer and that’s right up Conor’s alley. At the B&B, he meets Kate (the owner) and Abigail ( I was really excited to dig into this book because Book 1 was so good. This story had it’s charms as well but I did enjoy the first book more. Our hero, Conor McBride, is in dire need of some serious rest and relaxation. He goes to great pains to walk away from the espionage business that entangled him and his brother in Book 1. A fancy but quiet Vermont Bed & Breakfast needs an experienced dairy farmer and that’s right up Conor’s alley. At the B&B, he meets Kate (the owner) and Abigail (the motherly demanding chef). Kate is a painter who’s currently suffering from artist’s block. She sits in front of her canvas day in and day out not painting because she lacks that spark. She does have a good sense of humor and can be stubborn and decisive. Sometimes I liked her and sometimes I rolled my eyes at her. She’s initially a little prickly with Conor, assuming that Conor has assumed she’s incompetent at farm work. Kate says she’s good with the tractor but we never see her doing any farm work, so I have my doubts. Kate is directly tied to my one complaint for this book. I don’t mind a little romance with my espionage thriller, but I do mind characters being idiots and Kate was often an idiot and it usually was because of the romance. She is idiotically jealous over something Conor mumbles in his sleep. In another incident, she feels that Conor needs to ask her forgiveness and I felt she was being high handed, needy, and immature. Finally, there’s this end stage of the spy operation and Kate insists on going along with no spy training. This was such a bad idea but she bullies her way into it, endangering everyone. I really dislike it when stories use this particular ploy to make room for drama later on. So, yeah, I wanted to like Kate but I felt that she was mostly useless and at times detrimental to the other characters. I loved that Conor played his violin for Kate. They chat about art in general and her artist’s block. Conor makes a comment along the line that Kate is making it all about herself instead of the art – and that sums up Kate perfectly. She’s not a bad person but she is self-centered. Along this same line, I have to say that the ladies in this book are all comforters or love interests. Kate and Abigail and Yvonne (I think I have her name right) are well written but I wanted more from the women in general. It’s the modern age and lady spies have been around for hundreds if not thousands of years. It would nice to see that reflected here. Setting that aside, it was great to have Frank Murdoch and Sedgewick back in the game. Conor thought he had been clever, had left his old life behind, but he’s also new to all this spy business. So he’s not too surprised when Murdoch reaches out and has an assignment for him. There’s some unfinished business with Vasily Draganov, the big baddie from Book 1. Conor is still mourning his brother Thomas and his mother Brigid and the loss of the family farm. I could easily see how torn Conor was – go after this man or put it all behind him and try to heal. At the end of Book 1, I wasn’t sure how much to trust Sedgewick and Murdoch but now there is a true bond among the three men. They each go through this new crisis and come out knowing each other better. Sedgewick is still a bit paranoid and rougher around the edges and Murdoch is still all proper English (doing his best to hide his heritage). There’s plenty of double crossing and double agents stuff going on. It’s clear by the end of Book 1 that one of the good guys was feeding intel to one of the bad guys. Now in this book, that gets dealt with and wrapped up. Also, there’s a lingering string back to Thomas and to Conor’s farm caretaker (no longer employed since he sold the place) Phillip. I was delightfully surprised with the big reveal on that and also on how it got handled. All told, 4/5 stars. If the next book comes to audiobook land, I will give it a listen because I think Kate can grow and become useful. The Narration: Wayne Farrell was great! He has a light Irish accent for Conor that is just perfect. He also does a good job with the female voices. I loved his voice for Sedgewick, especially when Sedgewick was being rude or was in the grip of malaria or alcohol. He also had a good kid voice for the young lad. There were no technical issues with this recording. 5/5 stars. I liked the book despite everything negative I shall have to say about it. This is the second book of a trilogy, but it could stand alone. Again, the DEA, CIA, MI6 and more like agencies were involved. A wife has grieved over the death of her husband until she finds out he was a no good con man trying to steal her fortune and who is indeed alive rather than dead. Learning that and figuring he could be eliminated because of his high crime activity was the most thrilling part of the book. I did no I liked the book despite everything negative I shall have to say about it. This is the second book of a trilogy, but it could stand alone. Again, the DEA, CIA, MI6 and more like agencies were involved. A wife has grieved over the death of her husband until she finds out he was a no good con man trying to steal her fortune and who is indeed alive rather than dead. Learning that and figuring he could be eliminated because of his high crime activity was the most thrilling part of the book. I did not like author's use of too much uncalled for obscenity. Padding books with obscenity flung with carelessness demeans the author. The same is true for graphic sexual activity, which the author did not do. Thank you very much. Whatever an author cannot use effectively should not be used at all. Otherwise, the author's writing was good. I had no trouble with the host of characters. The information dump near the book's end accounted for all of the people and almost all of their actions. The hero would have died in the end had his mother's spirit not come back from the dead to save him. I liked that picture of maternal love. We are proud to announce that THE SECRET CHORD (Virtuosic Spy #2) by Kathryn Guare is a B.R.A.G.Medallion Honoree. This tells readers that this book is well worth their time and money! When I turned the last pages of « Deceptive Cadence », Kathryn Guare's debut and brillant novel, I was wondering what breed of cows (Jersey ? Holstein ?) Conor McBride, the hero, was going to milk in Vermont in the coming sequel. I still don't know after reading « The Secret Chord », but never mind. Actually McBride had little time to milk, and plenty to do to escape his ennemies while falling in love with Kate. I gave 5 stars to « Deceptive Cadence », and feel compelled to give 5 again to « The Secret Chord ». Kathryn Guare writes elegantly, her book's plot is terrific, full of twists and surprises. She has a deep sense of places, and the psychology of her characters is perfect. This author really deserves to be discovered by a large audience. Conor McBride is a fascinating character. I am glad to have met him. The setting for book 1 was interesting as well. This book had just a few too many unlikely twists to the story. To find out what they were, you'll have to read the book yourself. The 2nd book in this series and another great read. You feel the countryside and all the beautiful places so well described in this tale,I totally enjoyed every moment! The story is wonderful with characters that you want to know everything about,they become your friends as the story unfolds,and you hate to see the end arrive I am looking forward to the next book about the Virtuosic Spy! Wonderful characters, great story! Great settings in Vermont, Ireland, and India. I highly recommend The Virtuosic Spy series for those who look for detailed mysteries, with complex characters. This is the second book in the series. Deceptive Cadence, the first in the series was recently released as an audiobook! Available through Audible! Hoping there will be a fourth installment!! This series is a fresh tangle of the sublime and the intense. While generally a gentle man, whose loves are his family, the Isle of Dingle in southwest Ireland, and his precious Pressanda violin. He is also an M16 agent who gets pulled into dangerous missions for the British Government. Another top-notch offering from Kathryn Guare. I especially enjoyed the Vermont settings in this one, and the addition of the character of Kate. I'm already looking forward to book 3. 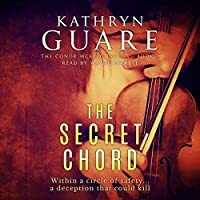 I just finished reading The Secret Cord (book 2) in the Virtuosic Spy series by Kathryn Guare. I loved the intrigue and the love story. Cannot wait to read more about Conor McBride! The two books in this series are some of the best writing I've come across in years and I would probably put the author head to head with the giant's of this genre. This series is such a joy to read. Romance and action. I am looking forward to the next book which should be out soon. I hope Masterpiece Mystery produces this series. Let me get this out in the open. You will be lost and confused if you just jump right in to this read without having any background with the characters or the series. I highly suggest you go back to book one of this series and pick all the bits and pieces that lead up to this point. At the same time if you are good at keeping track of multiple tangled webs of lies, deceit, secrets, double crossing, mystery, suspicions, and more of the like. You may just be able to get away with jumping right in. I on the other hand was not so fortunate. I had to go back to book one and I will say that I am very happy that I did. I was able to get lost in this world and it was a good thing. I found a fantastic tale that lead down this road only to change at the corner and turn down a different direction. It was not just the main character(s) that pushed more onward. It was the chase, the thrill, the mystery, the suspense, and yes of course the fact that our main character was a fabulous musician. The core of characters allow you to see deeper than the skin and it takes you on an adventure all on its own. Characters, landscapes, relationships, friendships, dangers, music, beauty, combined with a plot steeped with suspense, action, intrigue, and more. I was drawn in on this one and look forward to find out more of what these characters find themselves in next.